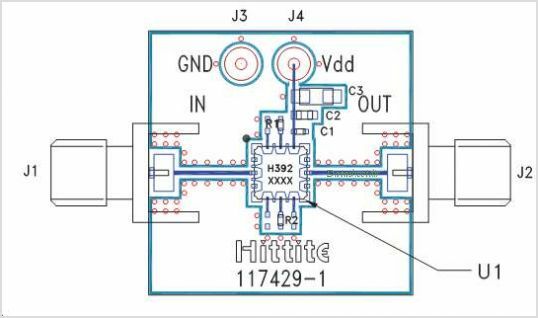 The HMC392LH5 is a GaAs MMIC Low Noise Amplifier packaged in a hermetic surface mount package which operates between 3.5 and 7 GHz. The Amplifier provides 15.4 dB of gain, 2.5 dB noise figure, and +24.5 dBm output IP3 from a single +5V supply. The HMC392LH5 has six biasing options which allow the user to select the bias point and output power of the device (+13 to +17 dBm). The HMC392LH5 functions well as a low noise or driver amplifi er and is ideal for driving the LO port of Hittite mixers. The HMC392LH5 is well suited for high reliability military, industrial and space applications. This is one package pinout of HMC392LH5,If you need more pinouts please download HMC392LH5's pdf datasheet. 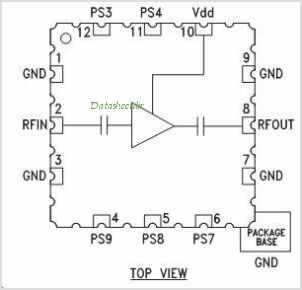 This is one application circuit of HMC392LH5,If you need more circuits,please download HMC392LH5's pdf datasheet.